Infinix has launched the successor to last year’s Infinix Hot 6 device in East Asia and it is the Infinix Hot 7 as expected. Although there is only slightly noticeable difference between the newly launched Infinix Hot 7 with its processor Hot 6 device, but we are still certain that you will love the upgrade. The 3 major noticeable differences between the new Hot 7 and former Hot 6 are the display size, the design and the colours. Infinix Hot 7 spots a slightly bigger 6.2inches display as against the 6.0inches that the Hot 6 features. Again we mentioned some slight design as you will notice that the Infinix Hot 7 appear sleeker and also with notched design that houses the selfie camera, flash and proximity sensor. But like the Hot 6 chipset, nothing changes with the Infinix Hot 7 SoC as it also spot a 1.3GHz quad core MTK6580 processor. Coming to the front of the Hot 7, you will notice an 8MP Artificial Intelligence (AI) selfie shooter with a single LED flash. Since the Infinix Hot 7 came in 2 variants, the 1GB RAM variant spot only a single 13MP rear camera while the 2GB RAM variant features dual rear shooters of 13MP and 8MP. The 1GB RAM variant also runs on Android 8.1 Oreo Go Edition for better RAM management as opposed to the 2GB RAM variant that runs on normal Android 8.1 Oreo. Then for the battery capacity, both variants features 4000mAh battery with quick charge technology. Like the Hot 6 Infinix Hot 7 also came with the 3D Dirac surround sound dual stereo speakers but the now this new device boast of the first Infinix device to come out of the box XOS Honey bee V4.1.0 as it runs alongside the Android 8.1 Oreo. It is important to note that this device like the Hot 6 also lack the 4G LTE technology and for now nothing like the Infinix Hot 7 Pro, but it won’t be a surprise if Infinix decide to come up with the 4G LTE variant in future that it might tag Infinix Hot 7 Pro. • Others: HTML5 browser, Face ID, fingerprint scanner, Accelerometer and proximity sensors, gyro document viewer, image viewer and editor, FM radio etc. 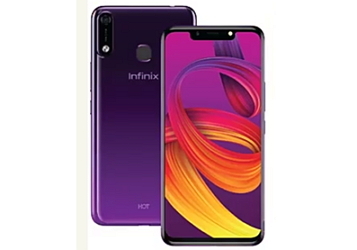 It is important to note there that it is the Infinix Hot 7 1GB RAM variant that has been launched but the 2GB is about to be launched and they both came in mainly 3 different colours of cosmic purple, midnight black and champagne gold, with a price tag of $100 (N37,000) for the 1GB variant, while the 2GB variant is expected to have a price tag of N$120 (N43,000).